So far it has been a tug-of-war over who gets to hold the Wee Baby T, so the idea of putting him down is a foreign one. But sometimes you just want to eat, shower, or do the dishes when no one is around to lend a hand. Enter the Rock & Glide. When I first put T down in the rock & glide and turned it on he was NOT impressed. It broke my heart because out of all the items we bought I had to work hardest to justify this one. “It’s essential; he’ll love it! We can actually get stuff done without having to hold on to him all the time!”. Fortunately after a couple of weeks he has grown to tolerate it (dare I say enjoy it? ), and he will even doze off in the seat while we have dinner or if company comes over. The Rock & Glide does what it says on the tin. Plugged in to the base, the seat will glide back and forth or side to side with 3 varying speeds and a selection of peaceful nature sounds or lullabies. Separate the seat from the base and it rocks effortlessly on plastic runners (with a little manual intervention). The seat also has a battery operated vibration unit, but as I mentioned in a previous post, T doesn’t appreciate that very much. The unit itself takes up a substantial amount of space – about 8 square feet. Not something that just goes in the closet and comes out when you need it, which is unfortunate since you will probably only use it for about an hour a day. The Rock & Glide is fairly sturdy, yet isn’t so heavy that it can’t be moved from room to room. It was easy to put together, the instructions were fairly clear. The motor runs almost silently, and the glide function is very smooth. The materials used to make the seat are soft and machine washable, which has come in handy already. This is where it took some convincing. The Rock & Glide cost nearly $160 at Walmart.ca, and is only supposed to be used for the child’s first 3 months, but it seems durable enough to last through multiple children if that’s your plan. If you are buying a bassinet, there really is minimal advantage to get the Rock & Glide as well. You can find a basic metal-frame bouncy seat online for around $20, and the end result will be about the same. This is one of those items that I would suggest buying 2nd hand, as it has no real safety features to be concerned over. 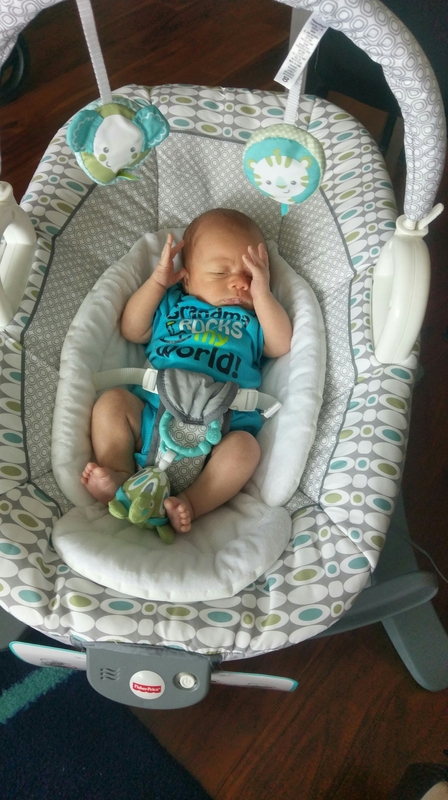 As always, do your research for recalls before buying used baby gear! Some babies love this sort of thing! What has your experience been with child seats?